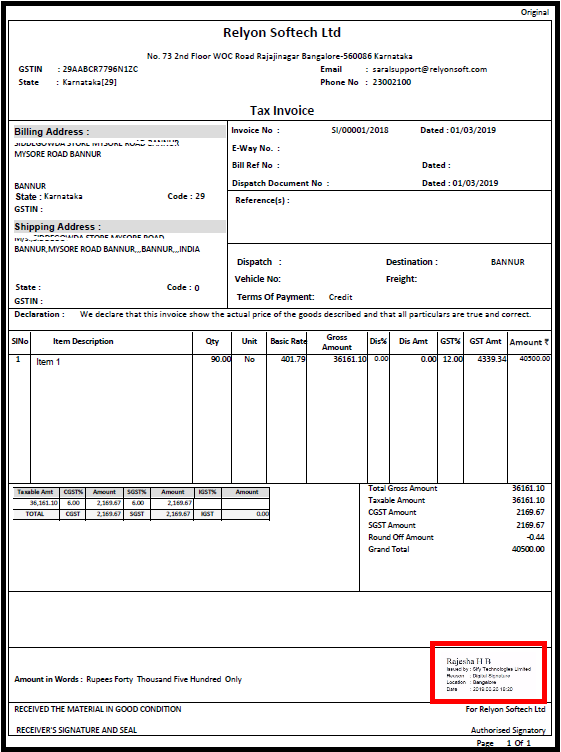 How to Digitally Sign Invoice in Saral - Accounting and Billing software? How to Digitally Sign Invoice in Saral? In this post, we will see How to Digitally Sign Invoice in Saral – accounting and billing software. 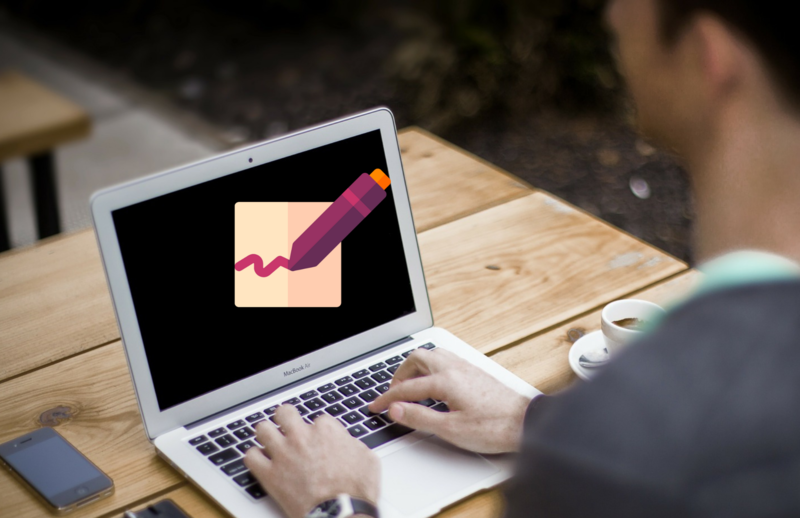 In order to digitally sign the invoice, first, the digital signature has to be enabled. Go to General Settings under Master menu. 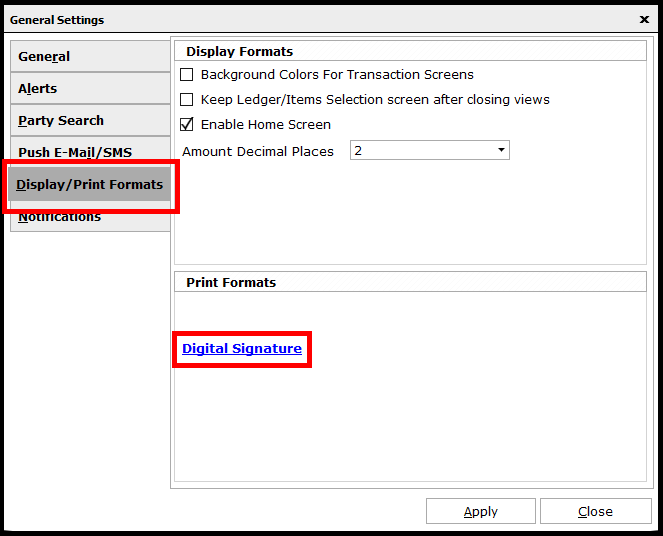 Here, select on Display / Print Formats and click on Digital Signature under Print Formats. 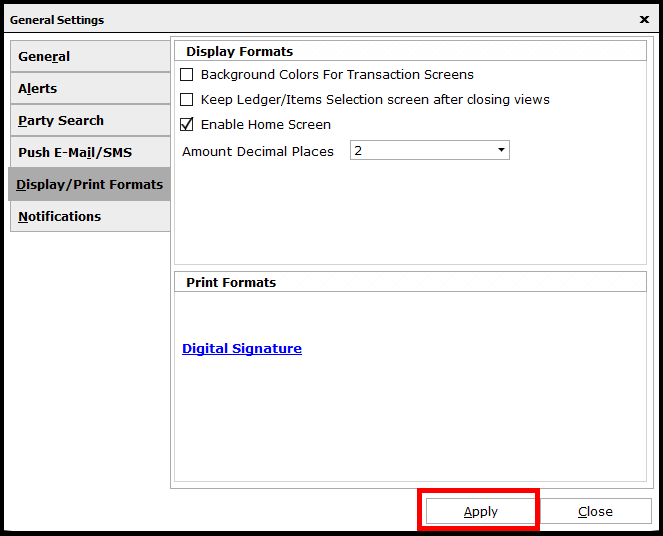 In the window displayed select the type of digital signature that will be used for signing. 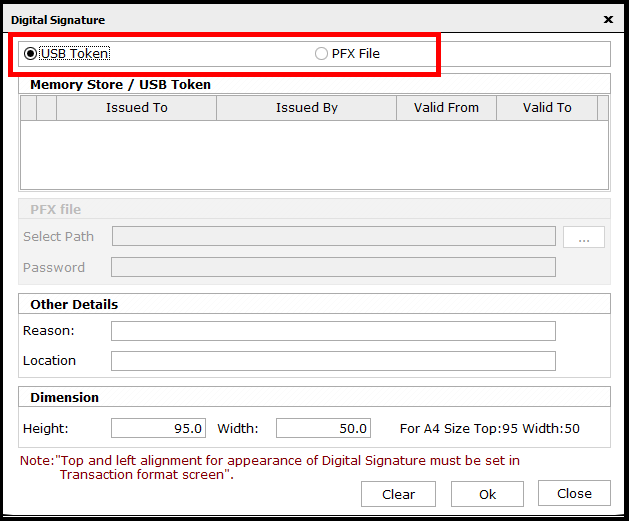 i.e., USB token or PFX file. 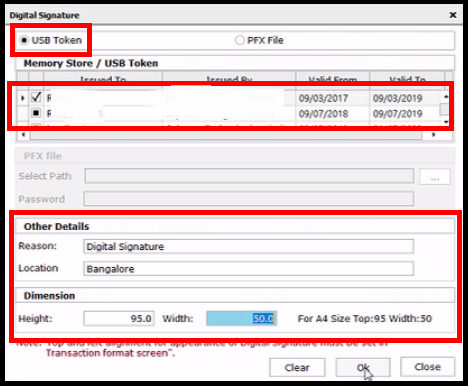 If USB token is selected, insert the USB token or you can load the signature to certificate store in the browser which will auto load the signature on the selection of USB token. Also, provide the Reason and Location of digitally signing. 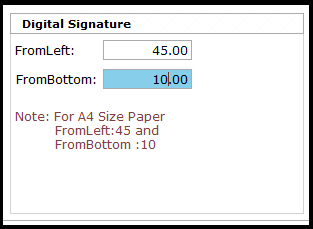 The position of the digital signature is auto taken under Dimensions, as per A4 sheet size. If any changes, enter the dimension required. 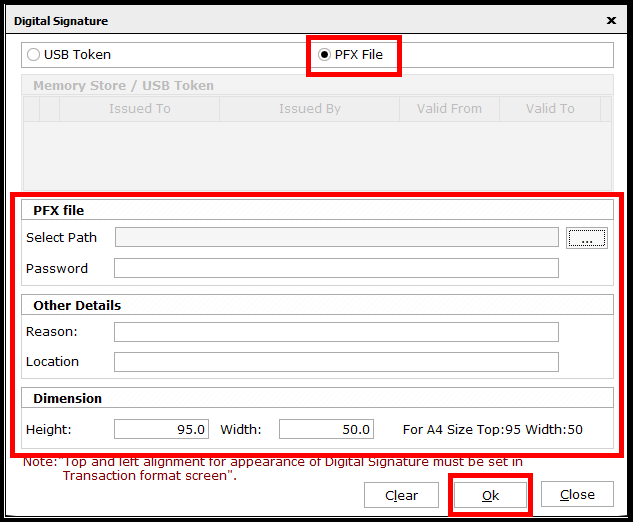 In the case of the PFX file, you need to select the stored file and enter the password of the file. The remaining details, reason, location, and dimension has to be entered as in USB token. After doing the required entries, click on Ok. 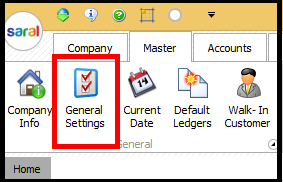 This will take you back to the General Settings window. Here, click on Apply to make the settings applicable. Next, the digital signature has to be enabled on the invoice. This is done at transaction formats. Go to Transaction Formats under Inventory. Here, select on Sales Invoice transaction and go to Heading/Caption tab. In this tab, under Digital Signature box, do the placement setting for the signature i.e. the location of the signature on the invoice, in terms of the centimeter, from the left and bottom of the page. 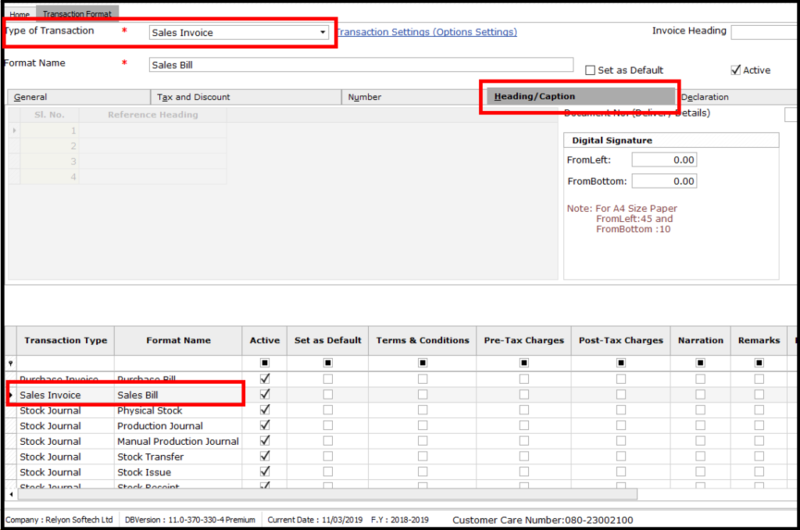 Now, go to Sales Invoice generation window and open a sales invoice. Here, click on Email link shown on the right bottom of the screen. The email composes screen will be displayed. 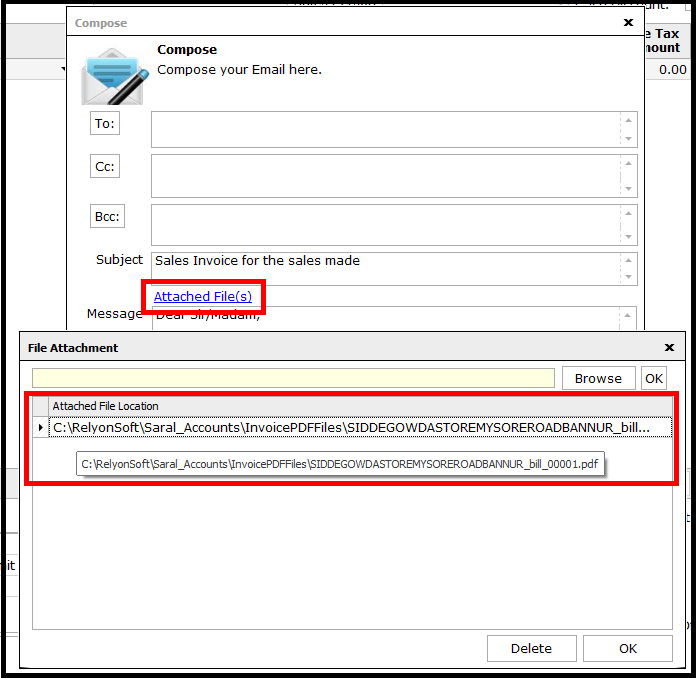 You need to do the e-mail configuration before sending the e-mail. Next, If the mail id is already entered in the party ledger details, the same will be taken here as To Mail. Else, the mail id has to be manually entered. To view the invoice copy attached, click on Attached File(s). You will be shown the attached invoice. Double click on the path shown; the PDF copy of the invoice will be opened. If you want any change in the location of signature placement, go back to the transaction formats and do the relative changes. This ends the post on how to digitally sign invoice in Saral software. Let us know your opinion by commenting below.